Altitude : 800 metres (2,600 ft)above mean sea level. Nearest Railway Station: Vangani (Central Line) or Badlapur Station. Difficult till cave on top of the massif (this part should only be done in winter). Mhasmal, Tavli, Haji Malang, Peb Fort, Matheran etc. Local rickshaw fare from Badlapur / Vangni Station till base village. Introduction / Induction at base village. 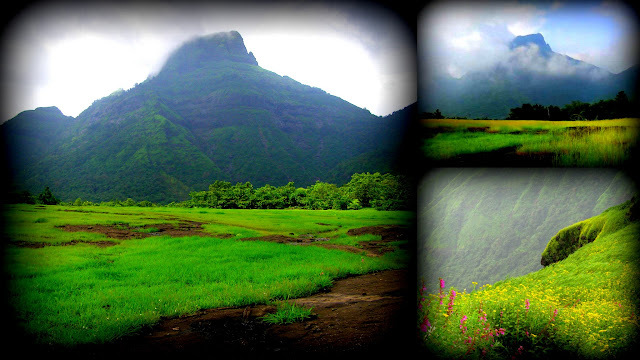 Chanderi is a majestic massif, 800 metres (2,600 ft) high, that stands out as one approaches Vangani station on the way from Badlapur to Karjat by train. Joined to Chanderi by a column are a group of four pinnacles called Mhasmal. [clarification needed] The Chanderi-Mhasmal duo is very prominent and can be seen from far-away peaks in the Sahyadris. Chanderi looks close from Vangani, but the better approach road to it is from Badlapur. From Badlapur Station hire an auto-rikshaw up to Chinchavali Wadi. From there you have a walk of about 45 minutes to the base of Chanderi Fort. To reach above takes about 2½ hours and to the summit takes another 45 minutes.